MunchPak Review: Monthly Snack Subscription Box | Nerd Much? Worldwide snacks to your door every month. If you’ve been paying attention to any of Nerd Much?‘s social channels this week, you might have noticed that we introduced a new header called Snack Much? — it’s our new snack destination. We love us some good noms, and when we come across something worth sharing with our readers, we feel an instinctive need to share it with our readers. Today, that something worth sharing is MunchPak. We’re super picky with our monthly subscription box choices, as some of them feel more like scams than anything else. We’ve tried a bunch of geek boxes like Loot Crate, My Geek Box, Anime Loot, Brick Loot, and more, but we’ve never dipped out toes into the snack crates. We’re going to start reviewing each snack crate to see if they’re worth it. And, first up is MunchPak, which includes imported snacks from around the world. We received a review package from MunchPak containing one of each box: a MunchPak mini, a standard box, and a FamilyPak. There are three different box tiers available: the MunchPak mini (which includes 5+ snacks for $14.95), the standard MunchPak (which includes 10+ snacks for $24.95), and the 20+ snack option, a FamilyPak, for $44.95. ** On top of choosing a box size, you’re also able to choose your own flavor profiles that you like, and downgrade those you don’t (which oddly costs $1 each to do so). Still, the fact that you can be as pick as you want to be is appreciated so that you can avoid getting garbage snacks in your box every month. You can also add drink options to each box for an added $5. What’s more, you can change the frequency from one month to once every week or once every two weeks. These options can make things a bit too expensive for our liking, so your best bet is to stick with the standard offerings. **Note: These prices are if you order one month only. If you pay upfront for 3,6, or 12 months, the prices drastically reduce. You’ll notice in just that one, small MiniPak, there is a nice variety of flavors. Some sweet treats, gourmet jerky (it’s Buffalo here, and in another box, we received Elk), some chocolate, and Mega Meanies (Pickled Onion puffs). Definitely some interesting flavors in here, and the Buffalo Stick was a highlight of the bunch. You can also use the companion app on your smartphone to learn more about your favorite snacks by scanning them. I’ll also note that there wasn’t any overlap between any of the boxes; we didn’t receive any of the same snacks in two different boxes. 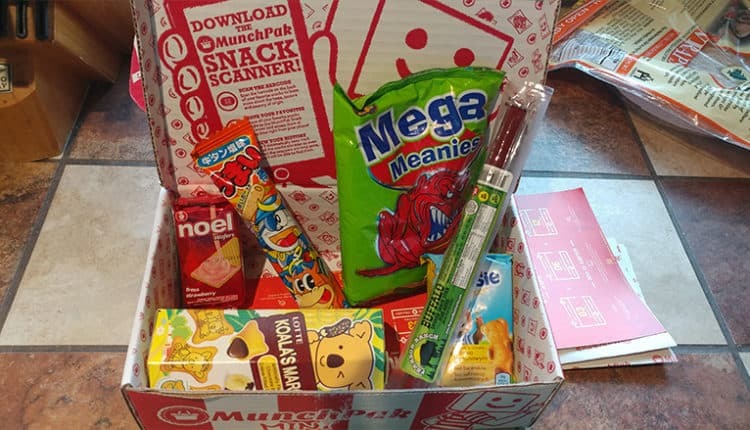 Each box had unique choices, and our only question now is how long could MunchPak keep that up (how long before we start seeing the same snacks in the future). The point of getting these type of snack boxes is to find new snacks that you can potentially buy individually, and while you won’t find most of these in a local grocery store, you’ll definitely find most of them available online somewhere. This is great if you find yourself loving one snack, specifically, that you want to order some more of. You can also find these individual items available for purchase in the MunchPak shop, so you’ll have no trouble finding these items after you’ve decided you want more. I’ll note that you can find many of these items for cheaper elsewhere on the net, so just double check before placing an order for specific, single items through the shop. With the MunchPak boxes we’ve received so far, we’ve been introduced to a ton of keeper snacks that’ll be adding into our rotation (for example, Cardamom Cashews by Sante Nuts are a new favorite). Each box contains an impressive level of variety of both flavor profiles and country of origin. To us, that’s what makes MunchPak a worthy subscription box; it’s the fact that we’re being introduced to new snacks we wouldn’t have otherwise heard of. If you’re someone who loves to try new treats, you’ll likely love what MunchPak offers. For snack selection alone, MunchPak gets the Nerd Much? seal of approval. Customize your snack box today! Want more fun things to snack on? Check out Snack Much? and follow us on Instagram and Twitter for the latest.